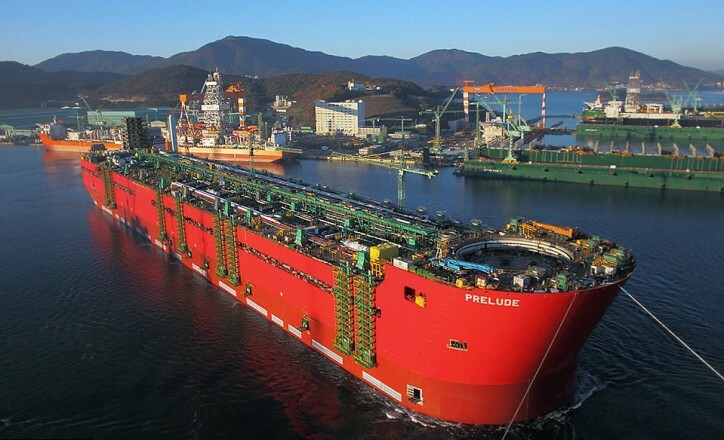 Shell’s floating LNG facility, PRELUDE, being built in South Korea has been making strides forward during 2015. During the year, the facility saw the installation of the last of its topside modules while the 17-kilometre long mooring chain weighing nearly 10,500 tons has been completed in Spain. Once completed, the Prelude FLNG will be held in place at the Prelude gas field off the northwest coast of Australia by the mooring chains for the life of the project. Prelude’s cargo tanks took shape during 2015, with one having the capacity to hold 39,000 cubic meters of liquefied natural gas and due to its size, Jean Chaplain, the storage tank lead, compared it to a cathedral. According to Shell, facility’s storage tanks will be below deck and will be able to store up to 220,000 cubic meters of LNG, 90,000 cubic meters of LPG, and 126,000 cubic meters of condensate. Prelude FLNG will pivot around the 93-metre high turret that will run through the facility. Four groups of mooring lines will anchor it to the seabed. The system allows the facility to turn slowly in the wind – absorbing the impact of strong weather conditions – while remaining moored above the gas field.